First of all, I had to get up at 4:30 this morning to make it to work by 5:15 and I saw something so pretty. I pulled the curtains and looked out into the darkness – behold, the lightning bugs! They were amazingly crisp and bright on the black horizon. I’m not sure if it was the big rainstorm we had yesterday or what, but it was something to see. According to my due date, we’re T-minus 7 weeks until this second baby arrives. When you look at 7 out of 40 weeks, we are very close! It’s funny, because I’m not that anxious about labor and delivery (not looking forward to it, but not really scared); more so, I’m thinking about all the things I need to get done before kiddo gets here. I’m sure that’s a natural thought for a working mom that already has a two-year-old (right?!). make up some freezer meals for easy dinners post baby (thanks to A Daily Dose of Fit for this great idea! )…I wish my younger sister was here to help me on this one – she’s great in the kitchen! I think that does it for the most part…Of course, there are the daily things like work and take care of our sweet little boy, but these are the main things I want to do between now and then. Ambitious, huh? Thankfully, I have a 3 day weekend starting tomorrow and my husband is off so he can help me with some of these things! I’m feeling MUCH better and seem to have kicked this old stomach bug (I think), so maybe I will have my energy back now. I also increased my iron intake like I did during my last pregnancy just to be on the proactive side since I’ve been feeling a little tired. So, what’s on YOUR to-do list for the next several weeks? We have a one of the best two-year-old boys any parents could ask for. About 90% of the time, he obeys and follows the rules. Up until the past few months, he had been good as gold and hardly ever got into trouble. Now, we’re a few months into the twos and I’m starting to see obedience issues. I’ve decided to take action! Last Friday night, I lost my temper when my husband, son and I went out to eat. I guess my pregnancy hormones are in full swing now, too (28 weeks along). We’d had a good day together and decided to spend the evening out and about. My son has started this thing we’re as soon as we leave the house it’s, “Home. Go back home.” We spend a lot of our time at home, so I don’t feel guilty for taking occasional family outings. Anyway, we assured him we’d be back home in a bit, but there were some things we wanted to do. Our first stop was a rug store since we’re looking to fill in some decorating gaps in our new home. Of course, a toddler could care less about the rugs, he just wants to hide in the rugs and run from mom and dad (“Chase” as he calls it). We were only in the store about 15 minutes when my husband decided to follow him outside; that’s when my son fell down and ended up in tears. We got him all buckled in the car and almost left the one rug we did buy in all the chaos. Second stop was the Goodwill store, where our son did pretty well. He likes riding in the “buggy” as we call it and he was pretty content for most of the time. When we went to leave, he wanted the car keys, so I gave him all but the one we needed to drive the car. He threw a terrible fit over that one key and cried like a maniac, even though I explained we couldn’t drive the car without it. At that point, I told my husband that we didn’t need to go to the restaurant at which we’d originally planned to eat. This place was a little more expensive and more suited for adults on date night…not a toddler who wasn’t going to behave. We decided to go to something quicker, less expensive, and more kid friendly. We ended up at our favorite Mexican restaurant where the son made a meal out of chips and cheese dip. I was happy because he was sitting still and eating. Then, he was full and we hadn’t even gotten our food yet. Of course, he didn’t think he needed to sit still since he was done with his food. So, the game began of going from one side of the table to the other. I finally told him he needed to sit still or he was going to sit in the high chair with the lap belt on. Did that deter him? No. We got the high chair and attempted to put him into it and he stiffened up straight as a board. At that point, I smashed my toe under the high chair (I was wearing flip flops) and that sent me over the edge. I knew our son needed a diaper, so I grabbed one up and grabbed him, throwing my purse on the table and exclaiming a word I will not repeat and was so disappointed in myself for saying. On the way to the bathroom, my son saw suckers at the checkout counter and asked for one. I told him when we got into the bathroom that he needed to “behave” and he would get a sucker when we left. Then, it dawned on me…did he know what “behave” meant? I asked him and he told me “no”. I had to explain that it meant to “obey” mom and dad and listen to what they say. We got back to the table and our food arrived shortly thereafter. I was so ashamed of the way I acted. Thankfully, I think my husband was the only one who witnessed it – him and God. I handed our son over to my husband who had ordered french fries (one of my kiddo’s favorites) and they began eating. All I could do was sit there and hold back tears over my plate of food. I finally pulled it together and started eating, then I apologized to my husband. I had the privilege of teaching Sunday school this week since the regular teacher was out of town. I found myself expressing my frustration with my parenting skills and the preacher’s wife suggested I read the book “Dare to Discipline” by Dr. James Dobson. She raised 3 kids that turned out really well, now who are all in their 20’s. I remembered hearing Dr. Dobson on the radio years ago and I always respected what he had to say. Also, he’s a Christian and uses Biblical principles, not just his own opinions and ideas. “Developing respect for parents is the critical factor in child management.” Dr. Dobson points out that this has to start at a very young age…in infancy, pretty much. There’s a story he tells to help very young children understand the importance of listening to mom and dad. It’s about a mommy bird who tells her baby to stay in the nest while she’s out to get food. The baby doesn’t listen, jumps out of the nest and is gobbled up by a cat. He goes onto to point out that you need to tell your kids that you tell them to do/no do things because you love them and know what’s best for them. And, if they don’t obey, they’ll have consequences (that was one of my mom’s favorite words when we were growing up). Raising your kids in a loving environment goes a long way. There’s the funniest description of how bad toddlers can be, but our son isn’t nearly what is described in the book. Thankfully, he doesn’t refuse to take naps or go to bed at night. I really learned a lot about getting him in a routine from the book “Becoming Babywise” before he was born. I love that book and have already started referencing it again for baby #2 who is on the way. I’m going to take notes from my reads and blog about them in the near future, so keep your eyes peeled. In the meantime, I’m open to questions/suggestions you have about parenting toddlers! This list could go on and on forever, but I’m honestly pooped right now. It’s about time for bed, but if I think of anything else I missed, I’ll add as another post. I challenge you to think outside the box and come up with your own thankfulness list. I had a young lady tell me today that she wants to make more money. When I say “young lady”, I mean a gal that’s about 10 years younger than me. I’m not old (31), but I’m not a young lady anymore, either. So, our conversation went back and forth. I guess I’m really a mom now, because I told her that the more you make, the more you spend and so on, and so forth. It got me to thinking (while I was peeling apples for my last round of apple butter) about the lessons I’ve learned in my adult life about managing money. I’m not rich by any means, but I’ve learned to live with what I have. When I changed jobs about a year ago, I took about an $8,000 pay cut. Ain’t that crazy? I was stressing wondering how I would ever make it on that much money, but I figured less gas (I cut my commute by about 60%) and brown bagging my lunch (I used to spend $10-$12 a day on lunch out!) would make up for most of that. And, I knew the good Lord would provide. Pay your tithes: If you are a God believing Christian, it’s your duty to pay your tithes (10% of what you make). If it weren’t for God, we wouldn’t have a single thing to our name and he expects us to give back. So, give back 10% of what you make to your Father. You will never have a need. Now, I’m not saying you will get all your WANTS, but your needs will be met. I have seen this happen time and time again. I’m glad my momma taught me this important life lesson. Create a budget: This one is a no brainer, but it’s dang hard! I really don’t have a full blown budget, but what I do is write down all my pay days and write what bills I have to pay with that check. I got in a bunch of financial stress years ago by NOT doing this, so this actually works. After I pay my bills, then I look at what I have left and know that’s my grocery and gas money, plus anything else I need/want. Put money in savings AUTOMATICALLY: Earlier this year, I set up an auto transfer from my checking to savings account, which occurs the Monday after each payday Friday. I really try not to touch that money in savings, but if times are tight or I have an unexpected expense, then I dip into that before adding to credit card debt. If you do it automatically, you don’t realize it’s missing. Save $1000 for a rainy day: I learned that from reading Dave Ramsey’s “Total Money Makeover” book. Thankfully, my cousin sent me that years ago and it was a lifesaver. I have managed to keep $1000 in savings for several years now. I may not be much more than that, but it’s there if I need it for some unknown emergency. And, it doesn’t take as long as you would think to save that much if you put your mind to it. AND, once you save it, it’s so darn hard to let it get below $1000…you feel so guilty! Buy clothes used: Up until this year, I thought I was too good for thrift stores, consignments, or Goodwill. But, when I bought a pair of new Levi jeans at Belk in the spring for $40, it made me sick! Since then, I have found Eddie Bauer and Ann Taylor jeans at second hand stores in wonderful shape for no more than $5 a pair. I feel SO much better about that and no one has to know I didn’t buy them new for 10 times as much. Make dining out a treat: We normally go out to eat about once a week as a family or couple and I will eat lunch out about once a week. Otherwise, we eat our meals at home and I pack my lunch. A can of soup and a peanut butter sandwich can be a satisfying lunch over a good book or magazine (or talking with a friend). I have grown to love cooking since I started working less hours. It’s actually fun and healthier (see #11) and you can eat well on a budget. One tip: eat less meat. Meat is so expensive and isn’t that fantastic for you. Invest some of your meat money into fruits and vegetables! My husband and son at Ruby Tuesday last Christmas after seeing Santa. Use coupons: I’m not one of those maniacs that have a binder full of 1,000 coupons (not to say I won’t be before my life ends), but I DO cut out coupons for things I buy like toothpaste, diapers, baby food, etc. I don’t cut out coupons for things I don’t need or that are too expensive. Just stick with the basics. And sign up for online coupon for dining out. I get Ruby Tuesday coupons all the time. The other night, my husband, son and I went out to eat there and we got out for like $25! I had a coupon for a free flat bread with any adult entree purchase, so I ate that while the husband had his customary ribs. That saved us probably $10 or more. Pay off your vehicle loan and keep it…and take care of it: I paid off my car last July after a SIX year auto loan (what the heck was I thinking?!) and I plan to keep it until it’s no longer driveable. Is it new and flashy like the 2014 models? No. Does it have scratches and dents? Yes. Do I care? NO! The seats are stained, but I keep the oil changed and all that jazz and it should last me (Lord willing) many more years. I really hope I can get 10 more years out of the thing if I play my cards right. Make money doing what you love…or at least LIKE: I loved the job I had for about 9 years, until my son came along. Then, I realized the stress of that job was going to interfere with my family. So, I made a change and I’m so glad I did. I really do enjoy work and helping people live healthy lives. I’ve liked most all the jobs I’ve had in the past. If I didn’t like them, I found something else. I’ve been a waitress, toe seamer at a sock factory, gas station attendant, cashier at a grocery store, website designer, technology sales person, and a Longaberber basket sales person. I really enjoyed selling those baskets and I made good money doing it. Do what you like! AND, if you find yourself in a job that you don’t like, work toward a job that you enjoy. From a Longaberger basket party I hosted YEARS ago. Be happy with what you have: Like I mentioned to my friend, I really believe if you make more money, you will spend more money. You think you have to have the nicest things, and you end up working harder and needing more money to pay for it all. We have lived in this single wide, 1987 mobile home for 10 years and we’re finally getting ready to get a house. Am I scared? I not really. We’ve looked at the numbers and can see we can afford it, but we’ve lived mortgage/rent free for 10 years! It won’t be fun to have 360 payments looming over our heads, but it will be nice to have something new (and that doesn’t cost an arm and a leg to heat during the winter!). I’m going to miss this little trailer we call home, but I know it won’t hold up forever. Our plan is to pay extra and get it paid off in 20 years. BONUS! Get/stay healthy: The most valuable thing you have in life is your health. If you’re not healthy, get that way right now. Or make steps to get as healthy as you can. The cost of health insurance isn’t going down and the more healthy you are, the less it costs to live. That gym membership may seem expensive, but it’s a drop in the bucket compared to having high insurance rates, lots of prescriptions and doctor bills. Me running a 5K a few years back. I’ve never done a giveaway on my blog before, so this is my maiden voyage. 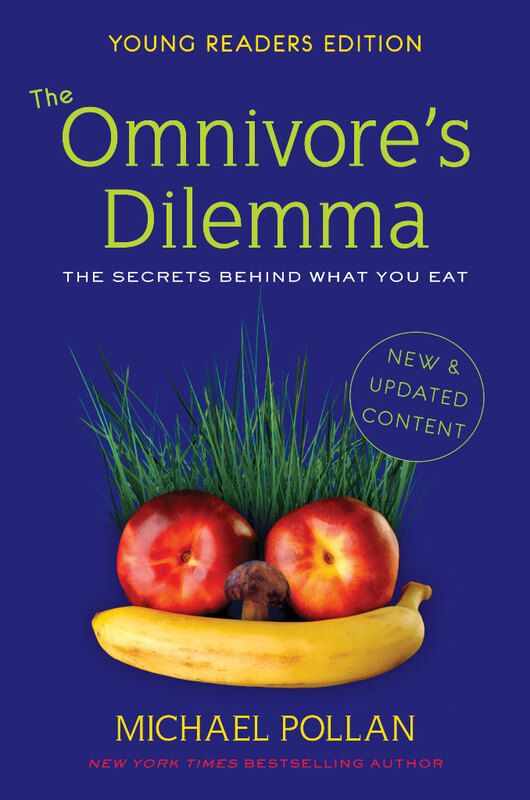 However, I read “The Omnivore’s Dilemma” a few months ago and it changed the way I look at food. I want to share this with you! It’s the Young Readers Edition, but that’s cooler because it has illustrations. If you want your very own paperback copy of the book, comment on this post and tell me why. I’ll pick a person and mail you the book (I’ll email you for your mailing address). No strings attached and completely free.